At his infamous zenith in the 1990s, Pablo Escobar’s drug-fueled empire—a vast underworld syndicate built upon the United States’ insatiable appetite for cocaine—made him one of the wealthiest criminals in history. With income peaking at more than $30 billion, the drug-smuggling kingpin spent lavishly on a sprawling estate for his family and members of his Colombian cartel. The excesses of Hacienda Nápoles, featured on Netflix’s wildly popular “Narcos” series, included a zoo stocked with exotic animals transported from around the world. But when Escobar’s empire came crashing down, the animals were relocated to new homes. Lions and giraffes, sure. But relocation isn’t nearly as simple for the largest occupants of Escobar’s zoo: hippopotamuses, the herbivores that are placid in appearance but several thousand pounds, territorial and dangerous. In the years since, four original hippo inhabitants of Escobar’s zoo have gone rogue and multiplied to more than 40 animals—but the count could be 50… or even 60. No one knows for sure since the animals are difficult to track. 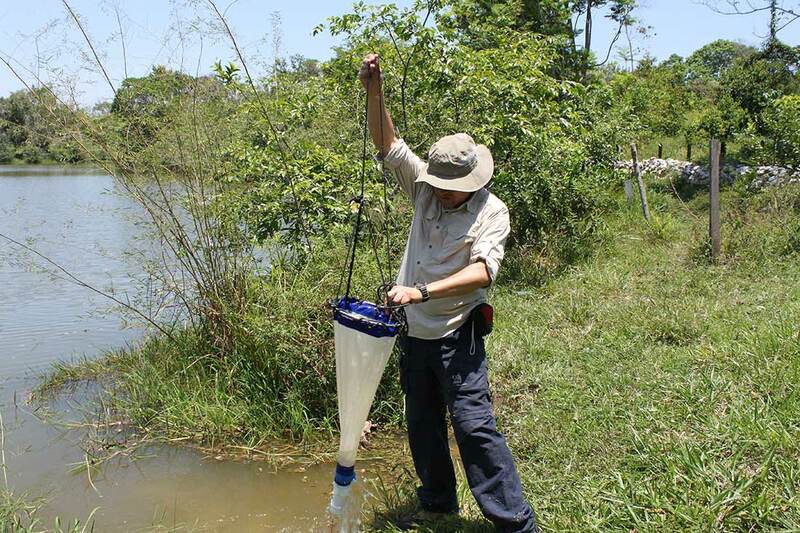 The bizarre situation caught the attention of UC San Diego Division of Biological Sciences Professor Jonathan Shurin, who has collaborated with Colombian scientists over the years on a variety of scientific projects in aquatic ecology. Four hours east of Medellín in northern Colombia’s Puerto Triunfo municipality, the hippos of Hacienda Nápoles have become a tourist attraction. Since Escobar’s days they’ve fanned out and formed family groups in small lakes around the region. Lone males can be seen wandering about—evicted from their families when they reach maturity—looking to attract mates of their own. Hippo power struggles and battles for dominance have resulted in deaths of the losing males. 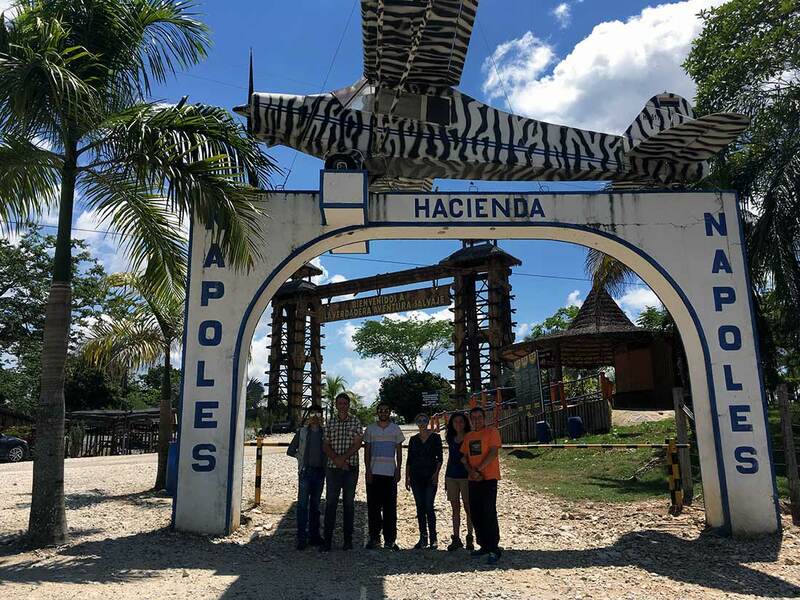 For the past two years, Shurin and UC San Diego postdoctoral researcher Natalie Jones have been working with Associate Professor Nelson Aranguren-Riaño of La Universidad Pedagógica y Tecnológica de Colombia (UPTC) on a hippo research project funded by the National Geographic Society. 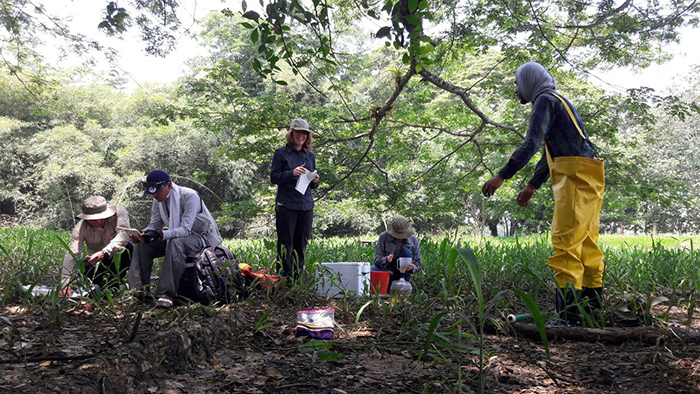 Along with students from UPTC, fishermen, researchers and veterinarians, they have been analyzing how the hippos’ presence may be altering nearby lakes and the Magdalena River. Hippos are classified as “ecosystem engineers” since they move key nutrients from one ecosystem to another, not unlike how salmon transport ocean nutrients to rivers upstream. The researchers use oxygen loggers to measure daily aquatic oxygen cycles, as well as instruments to study microbiome samples, plankton, insects, invertebrates and a range of other inhabitants. They’re also capturing audio recordings to characterize soundscapes and identify the various frogs, birds and bats calling at night. Their analysis in the region covers hippo impacts cutting across a spectrum of occupancy, from a lake with a persistent hippo population, to lakes where they sporadically appear, to lakes where they have never been seen. Shurin will present initial results of the research in June at an Association for the Sciences of Limnology and Oceanography conference in British Colombia. 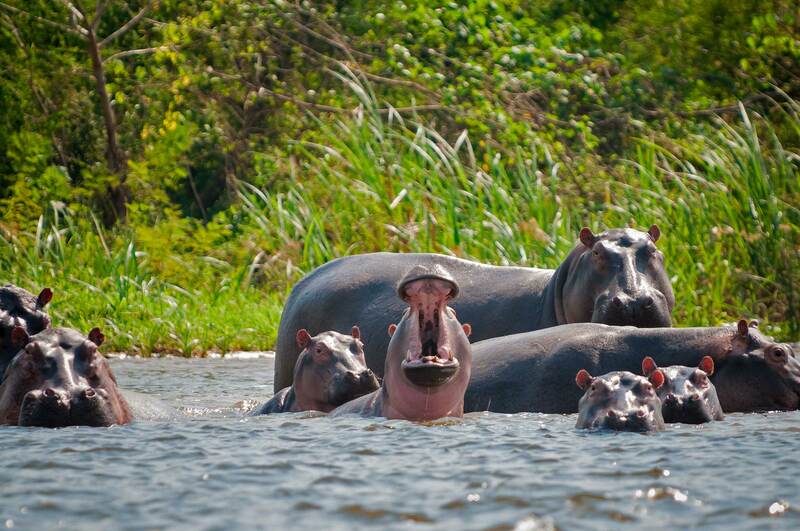 If the results reveal adverse environmental impacts from the hippos, the situation becomes more urgent for CORNARE (Corporación Autonóma Regional de los Cuencos de los Rios Negros), the local government agency in charge, to take action to manage the hippo population. Biologist and Colombian native Aranguren-Riaño is consistently surprised to see the hippos thriving in their adopted environment. For Shurin, the unique aspects of the project and basic biological questions allow him to go back in time to catch a glimpse of a period thousands of years ago when massive creatures roamed the Americas. Escobar’s hippos mirror long-departed continental inhabitants, or “ecological ghosts,” such as mammoths, mastodons and other giants on display at locations such as the La Brea Tar Pits and Museum. Big questions surround Escobar’s hippos and what to do with them. Yes, curious tourists give the local economy a boost. But the CORNARE officials in charge of managing the area would like to round them up and send them off to new homes. Another issue is their appearance as a gentle, amphibious cow, sharing the same calm appeal of a manatee. During trips to sub-Saharan Africa, the hippos’ native land, Shurin observed locals as deathly afraid of the animal, avoiding them at all costs. The hippos’ relationship with Colombians is markedly different. Jones said hippos didn’t pay the research team much attention during field work. Shurin is interested in extending the work into a comparative study of hippo behavior. In Africa, hippos are hunted by lions when they stray too far from water. In Colombia, no such predator exists so they can move about more freely. With each passing year, as their population and footprint expands, the frequency of hippo-human interaction increases around Escobar’s former drug empire estate.